International students may improve their Spanish language skills at our Language Centre (Centro de Idiomas). Grammar, conversation and cultural courses are offered through intensive Spanish courses, tailor-made courses and semester and year-long courses. This course is designed for students who want to improve their language skills before beginning the semester. It takes place prior to the start of each semester and offers in-class instruction as well as numerous visits to historic and cultural sites in and round Madrid. Moreover, students can receive ECTS for this course. Definitely a perfect way to kick-start one’s stay abroad! Dates: August, January and June. Spanish Artistic Manifestations in Context. Panorama of Spain within the Context of the European Union. guided visits to several museums and places of historic or cultural interest in Madrid. Guided visit of the Habsburgs’ Madrid. International students can also take advantage of free semester-long Spanish courses (that actually contain ECTS). These classes are held twice a week for 90 minutes and cover all aspects from grammar, vocabulary, pronunciation to oral and written communication. Students are usually divided into groups according to their individual levels. Those students who intend to study the whole degree at the UFV will have acquired a mínimum Spanish level before starting their studies with us. However, in order to help them integrate in their new environment as soon as possible and follow the classes easily, we offer a special Spanish course for them throughout the academic year which takes place twice per week (30 hours per semester). 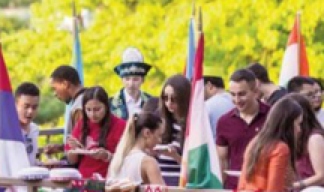 Many of our students are interested in taking part in this programme, as it puts them in touch with people from all around the world and allows them to practice the languages they are most passionate about. Why not make one’s Spanish level oficial by obtaining the DELE? 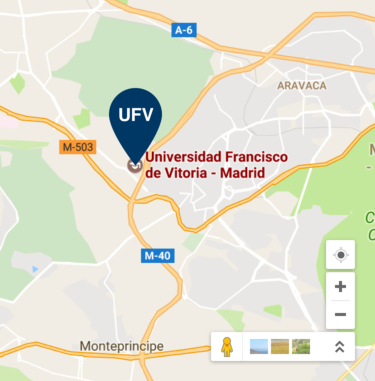 Universidad Francisco de Vitoria is proud of being an official testing site for the DELE exam (Spanish as a Foreign Language certificate, issued by the Instituto Cervantes). The DELE diploma is the only official accreditation of a student’s degree of fluency in the Spanish language and is recognised internationally among multinationals, chambers of commerce and educational institutions. At UFV, students may prepare for the exam in private classes. Upon passing the DELE exam, students have tangible evidence of their language skills.